Slow-cooked pork shoulder adds flavor and affordability to this recipe. Cook tomatillos and garlic in large skillet on medium-high heat 10 min. or until roasted, stirring frequently. Add chiles; cook and stir 1 min. Peel garlic; add to blender with water, bouillon cube and 1/4 cup cilantro. Blend until smooth. Heat oven to 350ºF. 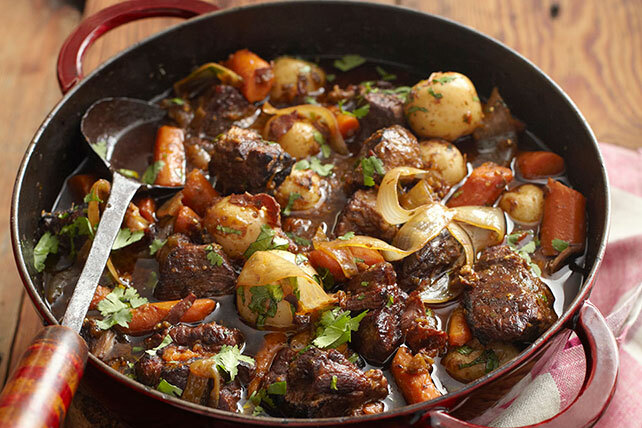 Toss pork shoulder chunks with steak sauce; cook, in batches, in large skillet on medium-high heat 4 min. or until evenly browned, stirring frequently. Transfer to ovenproof Dutch oven. Add ham, vegetables and tomatillo sauce; mix lightly. Cover. Bake 1 hour 15 min. or until pork chunks are tender. Stir in remaining chopped cilantro just before serving. Cascabel chiles add a deep, smoky nutty flavor to stews, soups and sauces. About 1-1/2 inches in diameter, these round reddish-brown chiles have a smooth shiny, thick skin. Cascabel chiles are sold in a dry form and can be found at Hispanic grocery stores next to the dry chiles, spices and condiments. Prepare tomatillo sauce and meat mixtures as directed. Bring to boil; cover. Simmer on medium-low heat 1 hour 15 min. or until pork chunks are tender. If you don't have an ovenproof Dutch oven, cover handles of regular Dutch oven with several layers of foil before placing in oven. Or, you can bake recipe in large casserole instead.